– UJS: Fixed audio issue for some players. – UJS: Fixed a bug that made the deployment slider and inspect window close when trying to drag them. – UJS: Increased buffer around the edges of the map. – UJS: Fixed deploy hotkey on OSX. – UJS: Decreased font size of input boxes slightly. – UJS: Fixed the “next game” button. Thanks to Pooncrew for reporting this. – UJS: Fixed going back from playing community levels. Thanks to Muli for reporting this. – UJS: Fixed images in the “pick your team” and “pick your color” dialogs. Thanks to Muli for reporting this. – UJS: Fixed custom scenario editor focusing on text box. Thanks to Muli for reporting this. – UJS: Fixed custom scenario editor hotkey for changing to Neutral. Thanks to Muli for reporting this. – UJS: Fixed broken image of boss 2. Thanks to Muli for reporting this. – UJS: Fixed a bug when two dialogs were open that overlapped that could allow dragging the underneath one when clicking on the above one. – UJS: Fixed a bug that made # characters get inserted to the end of the current url. – UJS: The highlight animation is now skipped when selecting very large bonuses to save on excessive CPU costs. Thanks to Master Farah for reporting this. – Unity/UJS: Fixed a bug that made NLC games not show teammate’s orders after clicking “Begin”. Thanks to Muli for reporting this. – All: Fixed a bug that sometimes caused AI colors to not be assigned correctly in community levels. Thanks to Muli for reporting this. – Website: Updated instructions to unblock Flash in Chrome 69. Warzone has just been updated to version 4.08.2! This update marks the official launch of the UJS client! The UJS client is the best way to play Warzone from computers (from iOS or Android you should continue to use the app.) It loads much more quickly than the Flash or Unity clients, and also don’t require a plugin like the Flash client does. Shortly after this update goes live, I’ll switch all players who play on the website to use the new UJS client instead of the old Flash/Unity clients. Of course, you can always switch back if you have an issue with it. But if you do, please let me know why! Version 4.08.2 of the Android and iOS apps will be delivered to the app stores soon. This version fixes a bunch of bugs (basically all of the non-critical bugs that have been reported to me while I was busy working on UJS). For the full list of fixes, see the Changelog below. This update marks a major turning point in the history of Warzone. With the UJS client fixing the slow-Unity-WebGL-performance problem, it means that we have finally accomplished the goal of the 2-year Unity project: One user interface that works well on all platforms (iOS/Android/Web). What does this mean for the future? It means we can finally get back to adding new features! For the first time in two years, my primary focus is adding to the game again. I’m excited to get back to it, as it’s what I love doing. As if that wasn’t enough, I’m going to start streaming my development of Warzone again, as I did last year. I’m not announcing yet what the first feature I’ll be working on is. You’ll have to tune into the stream to find out! Most of the streams will take place from around 1pm to around 5pm PST. They’ll be broadcast at twitch.tv/FizzerWL so give a follow if you want to be notified when they go live. I plan to begin as soon as I can finish the aforementioned iOS/Android update. – Website: Moved “Custom Game” link from the bottom of the play page to the single-player drop-down menu. – Unity: Updated Unity to 2017.4.10f1. – Unity: Fixed a bug that could cause chat to overlap the game when rotating your device. – Unity: Fixed a bug that could cause the app to temporarily freeze while websockets were connecting. – Unity: Tweaked number of tick marks on the graphs to better accommodate small phones. – Unity: Fixed a bug that caused Small Earth Board Map to have some flickering on Moto G phones. Thanks to Karl for reporting this. – Unity: If maps can’t be downloaded due to your device’s date/time being set incorrectly, the app now notifies you of this instead of giving an generic error. – Unity WebGL: Fixed a bug that allowed pasting more text into a text box than was allowed, resulting in errors. – Unity/UJS: Chat no longer scrolls to the bottom if it’s not already near the bottom. This allows you to scroll up and read earlier chat without it jumping back to the bottom when someone says something. – Unity/UJS: Fixed a bug that could cause an error in commerce NLC games. – Unity/UJS: Fixed a bug that caused an error when inserting invalid numbers into card weight box. Thanks to ReddRush1 for reporting this. – UJS: Fixed minification bug for improved performance. Thanks to Muli for reporting this. – UJS: Open Games list now returns commerce and modded games. – UJS: Fixed a bug that made the Commerce Game checkbox not appear in Army Settings. – Flash: Fixed “Open in UJS” link. – UJS: Enabled blockade dialog, as well as many other dialogs, to be draggable by their header. This makes them easier to move around. Thanks to elbee for reporting this. – UJS: Fixed double question mark in single-player game URLs. Thanks to DanWL for reporting this. – UJS: Fixed enter key inserting newlines into chat box. Thanks to 89thlap for reporting this. – Website: On the Switch Mode page, removed the word “default” from next to Unity and put it next to UJS. – UJS: Adjusted the way the chat button responds to clicks+drags to make it more reliable to click. Thanks to krunx for reporting this. – UJS: Fixed loading community level saves. Thanks to DanWL for reporting this. – UJS: Fixed sorting friends on Create Game page. Thanks to DanWL for reporting this. – UJS: Fixed searching for friends on the Create Game page. Thanks to DanWL for reporting this. – Website: Fixed tournament names. Thanks to celticfridge for reporting this. Update 4.08: UJS nearing completion! Warzone has just been updated to 4.08.0! This update adds a bunch of features to the new UJS client. When your account is in UJS mode, selecting Create Game under the multi-player menu, or Custom Game under Single Player, will now launch the new Create Game UI. This UI is much easier to use than the old Flash one, and also supports all the new Unity features such as commerce games and mods. It’s similar to what you would see if you were in Unity mode, except that it loads in a fraction of a second instead of in over 30 seconds! More importantly, this reduces our dependency on Flash even further. Now, the only thing that Warzone still depends on Flash for is for map creation. – UJS: Implemented the add/remove players button in lobby. – UJS: The app now sets the page URL so that game links can always be accessed from the address bar, just like Flash does. – UJS: Made some optimizations for faster performance on all UJS pages. – UJS: External links now open in a new window. 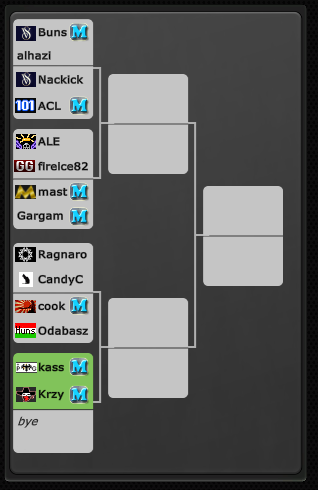 – UJS: Fixed team brackets in the lobby. The next step for UJS is to implement toasts, the level up screen, and the quickmatch template unlock screen. Toasts are the small popups in the top right that notify you when you receive points or unlock an achievement. This is the last thing to add to UJS before it can be declared feature-complete. Author FizzerPosted on August 28, 2018 Leave a comment on Update 4.08: UJS nearing completion! Warzone has just been updated to 4.07.7! This update contains some bug fixes and minor improvements. This is a server update only. This means the server updates, as well as the Flash and UJS clients, but not the Unity client or iOS/Android app. – All: When creating fixed team open games, the game now gives a prompt confirming you really want to do this. – All: Fixed a rare bug when publishing a community level that uses the army cap. Thanks to Panzerelite for reporting this. – All: Fixed an issue when using the API with the Non Members Can Use Mods flag. Thanks to Krzystof for reporting this. – All: Fixed a bug with boss4 that caused an error on community level 1157992. – All: Fixed a rare bug that could cause invite notifications to be delayed and go out after a game had ended. – Website: Fixed Share On Facebook. Thanks to DanWL for reporting this. – Website: Fixed a bug that caused signing into an account in UJS or Flash mode to show the Play button immediately after signing in. – Unity/UJS: When chat has plenty of room, it will give more space to the player’s name. Thanks to TBest for suggesting this. – UJS: Fixed tooltips getting stuck in Firefox. Thanks to TStorm for reporting this. – UJS: Fixed bonus links with negative sizes, such as was seen on the United States Big map. Thanks to TStorm for reporting this. – UJS: Fixed recon card territory highlight. Thanks to Krzystof for reporting this. – UJS: Fixed the Add/Remove Players button so it at least tells you that it’s not implemented yet instead of not working. Thanks to TBest for reporting this. – UJS: Fixed issue with opening/closing chat rapidly that would offset the screen. Thanks to TBest for reporting this. – UJS: Removed the far right vertical line in the Statistics table since it was overlapping the scrollbar. Thanks to TBest for reporting this. With these fixes, the UJS client is now looking much more solid than before! The next step is to get the Create Game UI working in UJS, so that it won’t have to fall back to Flash like it does today. Try the new UJS client! Do you play Warzone from your computer? Good news! The new UJS client is now available to everyone! The UJS client is being developed as an alternative to playing the Unity or Flash clients in your browser. The Unity client takes a while to load, and the Flash client is missing many features. UJS is the best of both worlds — it loads quickly and does everything! Yep, it’s even faster than the Flash client! Note that the UJS client is still being developed. Some parts of the app don’t work yet in UJS, such as the ability to create games, or be notified of points you earn and achievements you unlock. These things are coming soon. 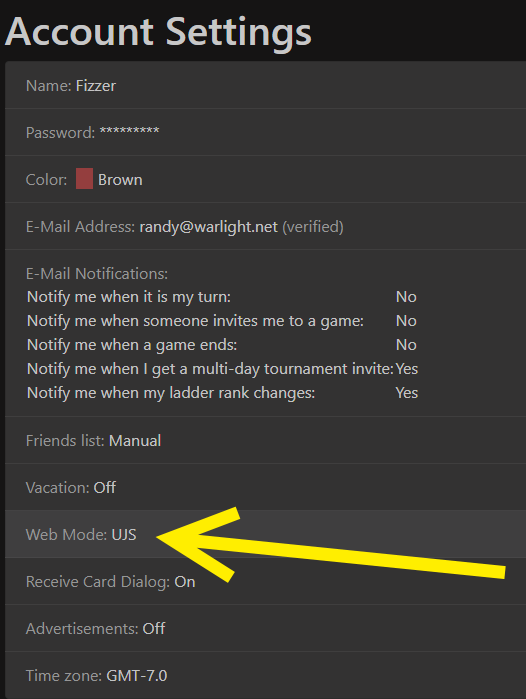 You’ll see the option to easily switch your account between Unity, Flash, or UJS. Feel free to drop me a line! If you find bugs, please report them and I’ll do my best to fix them. Author FizzerPosted on August 11, 2018 7 Comments on Try the new UJS client! Warzone has just been updated to version 4.07.1! This update brings improvements and fixes to the game. This blog post describes what’s new. In addition to the features below, this update will bring features from the previous updates to the mobile app, such as the new analyze tool for no-luck games. This update is available right now for the website and standalone versions of the game. The Android app will be available soon, likely tonight or tomorrow. The iOS version should be available within a week. Prior to this update, Warzone mails could only be read on the website at warzone.com. This created an issue where players who only play within the iOS or Android app would never even know if someone had sent them mail, and therefore never read it. With this update, anytime you have unread mail the button in the top right corner will flash a small envelope icon. Tapping this and then tapping Mail will allow you to read and reply to mail threads directly in the app. – Unity: Pressing the enter key after clicking on the attack/transfer mode button no longer closes the attack/transfer dialog. Thanks to DanWL for reporting this. – Unity: Fixed the positioning of the profile popup window on the lobby. Thanks to Muli for reporting this. – Unity: Fixed a bug that made attack arrows appear from the destination territory when double-clicking to attack a territory. They should only appear on triple-clicks. – Unity: Increased default map buffer to 3, to allow more space on the edges when zoomed in. – Quickmatch: Fixed a bug that could cause templates to randomly check themselves. – UJS: Fixed disabled buttons. Thanks to Master of the Dead for reporting this. Warzone has just been updated to version 4.07.0! This update brings a bunch of improvements and fixes to the game. This update is available on the website and standalone versions of the game now. The iOS and Android app won’t receive this update, because there was a lot of internal code churn I want to let it get tested for a bit before updating the apps. Both iOS and Android will get version 4.07.1 which will have this update’s features and should be released soon. 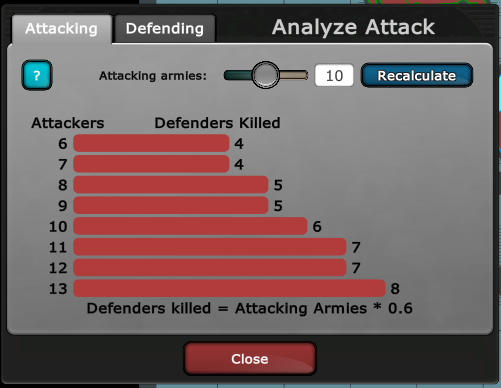 This allows you to easily see how many armies are killed by different numbers of attackers. This info was previously available in the attack/transfer dialog by typing in numbers into the armies box, however this new dialog makes it much easier to visualize. This new dialog also has the new “defenders” tab, which allows seeing how many armies are killed on defense. This data wasn’t available previously without doing the math yourself, so it’s a very useful tool! – All: History no longer needs to be downloaded from the server a game you’ve had open from the start, as is common in real-time games. – All: Fixed a bug that could cause an error when changing perspectives in history. Thanks to Min34 for reporting this. – Unity: Fixed a bug that caused an error if you pressed escape just as the turn was advancing. – Unity: Player names now use a fixed font size instead of auto-sizing. – Unity: Fixed a bug that made loading replays of community levels from the website sometimes cause an error. Thanks to Muli for reporting this. – Quickmatch: All multi-day games now honor vacations. – Quickmatch: When waiting for a real-time game, the templates now show your rating, setting icons, and thumbnail. 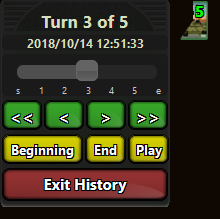 – Quickmatch: Leaderboard buttons are now colored, blue = template, green = built-in category, red = country. – Quickmatch: Templates with 0 votes are now automatically deleted. This happens once every 24 hours. – Quickmatch: All 1v1 templates no longer allow “booted players turn into AIs”. This fixes players from saying “surrendered” when they get booted, such as commonly happened on Imp Rom LD template. – Quickmatch: If a template falls off the top 40 and then re-makes the top 40 and you unlock it for a second time, it will now pop up an alert letting you know that it unlocked instead of silently unlocking. Thanks to Nemo for reporting this. – Website: Fixed a bug on profile pages of invited but not-yet-signed-up players. Thanks to DanWL for reporting this. This is considered an experimental alpha at this point, but if you try it out let me know what you think!